The amendment, which became the bill, can be viewed at: https://www.cga.ct.gov/2017/lcoamd/2017LCO07686-R00-AMD.htm . The bill now awaits a vote in the Connecticut House of Representatives. 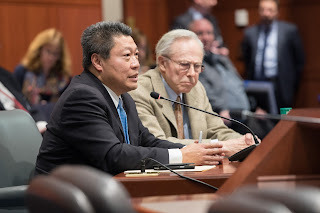 Photo: "No More Casinos in CT.” Sen. Tony Hwang (left) and former Connecticut Congressman Robert Steele (right), author of "The Curse: Big-Time Gambling's Seduction of a Small New England Town" testified on Mar. 9 against proposals to expand gambling in Connecticut. Gambling expansion legislation passed in the State Senate on May 23. Hwang voted “no”. The bill now awaits a vote in the Connecticut House of Representatives.